Based on the most recent scientific research and characterized by rigorous but accessible language, Put Yourself in my Shoes is an operative instrument directed towards all primary school teachers, workers and educators who want to promote the educational well-being of students in their daily activities by enhancing empathy and social relations through the development of the theory of mind. 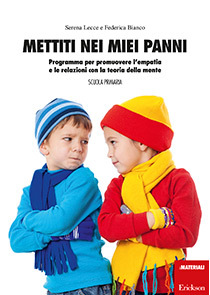 “Put Yourself in my Shoes” is a program to strengthen the theory of mind abilities in primary school children, created by a group of researchers from the University of Pavia (LASC), and to be used by teachers, educators, and workers in their daily activities with children. Frequently, teachers and educators lament about the general difficulty their students have with “seeing things from another point of view,” recognizing others’ needs and being aware of them. In this context, the theory of mind—that is, the capacity to put yourself in another’s place—represents a resource for the individual’s ability to develop and maintain good relationships with others (both dyadic and in a group) in the home and at school, with teachers and classmates, improving social competence. In the school context, a connection between theory of mind and academic achievement was noted. In particular, theory of mind seems to influence reading comprehension ability, the area of metacognition, and sensitivity to criticism. The recognition of the importance of the theory of mind for the development of social, relational and cognitive skills of the child, has led researchers to develop intervention programs to promote this ability. These schemes of work are intended to be used as a general point of reference, but can be modified and adapted according to the responses of the children and the level of the class as a whole, provided that the general principle of explaining the mental states underlying the behavior of the characters is maintained.